What is a "concrete camelback" bridge? Technically it is called a "concrete curved chord through girder" bridge. As mysterious and complex as these names may sound, the reality is simple to describe: it is a concrete through girder bridge that has been given an arched design. It is a rare design that is only found in the few states that ever built them, and among those states, Michigan's bridges were larger, built frequently (in the 1920s) and were also the most architecturally sophisticated. Experienced bridge historians will recognize these bridges as unique, beautiful and historically significant icons of Michigan. Unfortunately, highway agencies that own these bridges are often unaware of their significance. Even some out-of-state bridge historians fail to grasp the significance of these bridges both in the context of Michigan and on a statewide basis. Developed by C. V. Dewart, engineer for the Michigan State Highway Department, in the late 1910s, these concrete camelback bridges (also known as concrete curved-chord though girder bridges) were mostly built in the 1920s, particularly from 1922-1928. When he was designing the plans for this bridge type, Dewart was looking for a standard bridge plan that was easy to follow, used simple materials and resulted in a strong bridge that did not require much work to maintain. Since no one had ever seen bridges like this before, they at the time developed the nickname "Dewart's Tunnels". Today they are known by engineers as concrete curved chord through girder bridges. They are more commonly called "concrete camelback bridges." 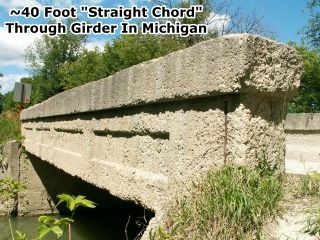 A typical concrete "straight chord" through girder was a structure type that enjoyed a brief popularity from the 1910s through the 1930s in various states. Some states, like Michigan and Illinois built many examples of this structure type. Other states like Pennsylvania built very few, although in Pennsylvania a couple individual counties designed and built many examples. The structure type quickly died out in the 1930s because they were no longer economical to build. They were already limited to only relatively short span lengths. Spans of 40 feet were common, and in general the longest spans were 60 feet. Longer spans would have required an excessive amount of concrete to produce a capable girder. Additionally, the same problem occurred if a wider roadway was desired. Most roadways for concrete through girder bridges are no larger than 22 feet wide. Wider roadways would have required an excessively large concrete girder. One way of reducing materials and/or increasing feasible span lengths was to provide a girder that was deep where the strength was needed (in the center of the span) and less deep where not needed (at the ends). Producing a girder with these characteristics produced a curved chord through girder bridge. This also has a side effect of producing a more visually pleasing structure, thanks to the graceful curve of the girders. 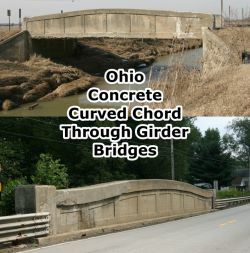 Michigan and Ohio appear to be the only states that built any sizable quantities of curved chord through girder bridges. A small number of examples have been found in Pennsylvania, Indiana, California, and Texas, but these appear to be isolated anomalies in these states. Ohio appears to have only used the concept of a curved chord through girder to reduce required materials in the girder; Ohio's curved chord through girder bridges display span lengths similar to straight chord girders: no longer than 60 feet. 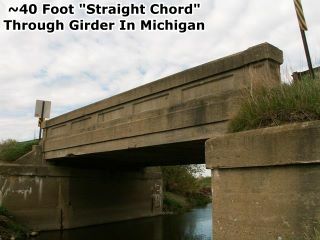 Michigan also used the concept of a curved chord through girder bridge to reduce materials. However, Michigan also used the curved chord through girder concept to enable longer spans of girder bridges to be built, up to 90 foot spans. As such, Michigan's largest curved chord through girder bridges (90 foot span) are 34% longer than what is the longest span in most states that have concrete through girders, which is a 60 foot span. Michigan also took far greater advantage of the aesthetic qualities afforded by the curved girder than did Ohio. Michigan concrete girders have smoother, more graceful curves, and the spans greater than 60 feet have pierced openings in the girders. Because Michigan's 70 - 90 foot curved chord through girder bridges exceed the length of concrete girder bridges in other states by up to 30 feet, these bridges demonstrate the economical limits of concrete girder construction better than concrete girder bridges in any other state. They should be considered to be historically and technologically significant on a national scale due to these lengths and the fact that they exist only in Michigan. Built essentially only in the 1920s in Michigan, they embody the characteristics of 1920s bridge construction in Michigan, with their use of massive concrete superstructures that support a narrow two lane roadway. Their unusually high aesthetic qualities only add to their significance. The bridges are not made beautiful by adding non-functional frills to the bridge. Instead, the curved girder itself (a functional part of the bridge structure) is also the central core of the bridge's aesthetic, and the decorative details cast into these girders serve only to complement, enhance, and emphasize the aesthetic qualities of the functional superstructure. This is dissimilar to modern bridge construction, where the structure itself is often an ugly, simple slab of concrete, and decorations are merely embellishments that attempt to hide the ugly superstructure, and perhaps visually mimic the aesthetics of a different, more attractive bridge type. Producing a bridge, like the curved chord through girder, with an inherently attractive structure represents a more desirable form of aesthetic. 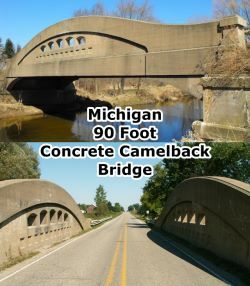 Michigan's concrete camelback bridges were a state standard plan. This means that a set of predesigned plans created by the state highway department were used by both the state highway department and local highway agencies as a template that could be applied to any number of bridge projects. As needed, additional plan sheets could be created to adjust or expand upon the standard plans to address the unique site requirements of individual bridge projects. This allowed for different substructure designs, multiple span designs, and skewed designs to be built even though these aspects were not covered in the state standard plans. Standard plans for this bridge type were generally available in lengths by five foot increments from 40-90 feet. 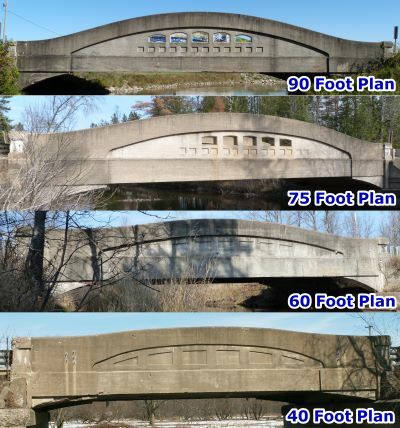 Click here to view a PDF containing a collection of selected scans of original standard plans for Michigan's concrete camelback bridges. Alternatively, download them as a zip file containing labeled JPEG files. Given the standard plan nature of these bridges, they are best discussed by classifying them based on which standard plan they followed. While each surviving concrete camelback bridge is unique, it also has a common standard plan root. 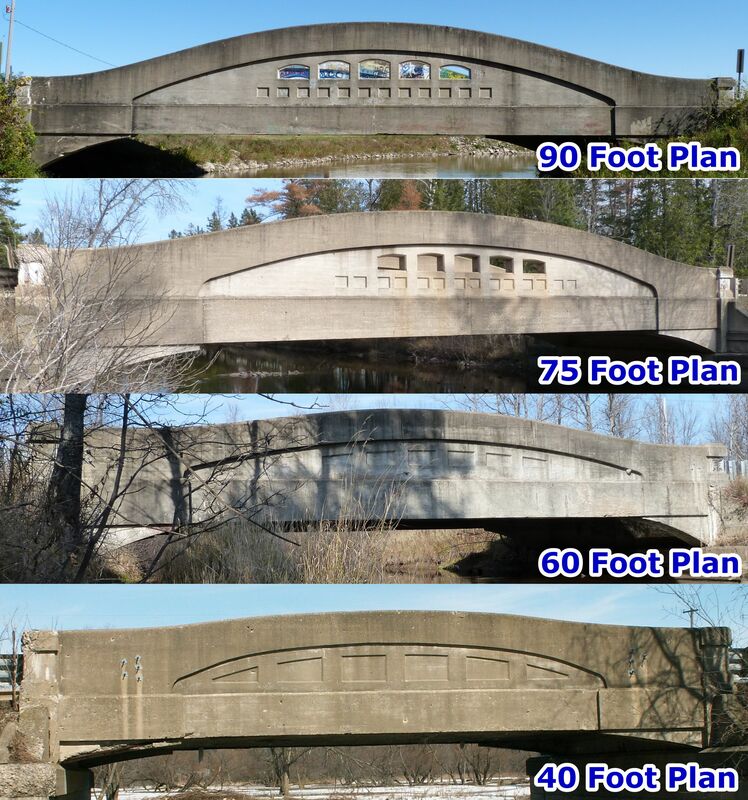 Although additional lengths were available in the library of standard plans, the surviving concrete camelback bridges in Michigan can be divided into a selection of several standard plans including 40 foot plan, 50 foot plan, 60 foot plan, 75 foot plan, and the 90 foot plan. All the plans outline bridges composed of two girders that are located alongside the edges of the roadway. Each girder is symmetrical and has architectural details that are the same on both the inside and outside of the girders. In 2013, using the standard plans for these bridges, MDOT produced a load rating guide for concrete camelback bridges. The guide can be downloaded here. The 40 foot plan is the only concrete camelback bridge plan that was the same length as a Michigan standard plan for a straight chord through girder. Structurally, it did not vary greatly from the straight chord design since the curving of the chord is only very slight. Visually however, the bridge appearance is quite different from the straight chord design. The architectural design of the concrete camelback is to emphasize the top and bottom chords of the bridge by having them stick out, while having the remainder of the girder web inset. As configured, the bottom of the emphasized top chord is curved down to meet the bottom chord while the top of the top chord levels off at the ends. The more strongly curved bottom part of the top chord gives the 40 foot plan a more strongly arched appearance than it would have without the architectural details, which enable this bridge to look more different and far more aesthetically pleasing than its straight chord counterparts. Finally, the center of the girder web has a series of inset shapes that are essentially rectangles except that the top is curved to match the shape off the bottom side of the emphasized top chord. The 50 foot plan is extremely similar to the 40 foot plan. The only difference is that the 50 foot plan has a far more defined curve of the top chord. The greater definition of the curve gives the 50 foot plan a far more graceful appearance than the 40 foot plan. The next step up, the 60 foot plan is extremely similar to the 50 foot plan. The only difference is that the slightly larger 60 foot plan has a slightly more defined curve of the top chord. The 60 foot plan is the most numerous among surviving concrete camelback bridges. 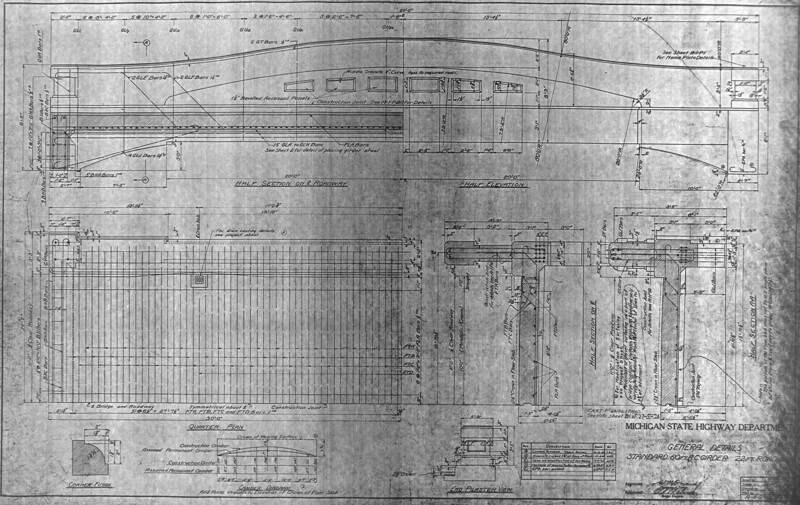 The 75 foot plan, despite being only 15 feet longer than the 60 foot plan, has substantially larger girders that also introduce a new set of architectural details. The girder continues to display an emphasized top and bottom chord. However, the inset rectangles with chord-matching curves on top have been replaced with two different architectural features within the girder web. In the upper portion of the web, there are five pierced openings or windows. Each follows the shape of a rectangle except that the top of the rectangle is an arch, and this arch is carefully designed so that the two openings at each end have arches that spring from the rectangle part of the openings at different heights to match the curve of the emphasized top chord. Below the pierced openings is a row of seven pairs of small inset squares. Five of the pairs are positioned directly below each pierced opening. The final two pairs are located in the same row but extend beyond the position of the pierced openings. The 90 foot plan is in general the same as the 70 foot plan. However to accommodate the 20 foot longer length the girders are deeper. The change in depth is enough so that the average car crossing these bridges will notice how the taller girders tower over the car, much more noticeably than with any off the other plans. Given this height of the girders, the 90 foot plan has the most defined arch shape of all the concrete camelback bridges. 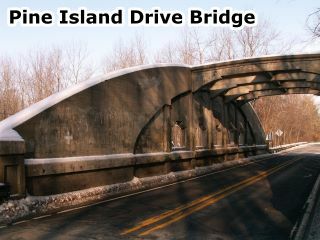 The Pine Island Drive Bridge in Kent County should be mentioned in any concrete camelback discussion. The only one of its kind in the state and with its 100 foot span, it could be called the king of Michigan's concrete camelback bridges. As discussed previously, the state standard plans for concrete camelback bridges went as high as 90 foot span. For this reason, the Pine Island Drive Bridge was not a standard plan, it was a custom-designed bridge, simply adapting the engineering and architectural thinking behind the standard plans. Aesthetic details on the bridge similar to those of the standard concrete camelback bridges. These include the pierced openings and use of inset patterns on a solid girder-like superstructure that has a graceful curve. However, the Pine Island Drive Bridge's pierced openings are a more ornate, almost keyhole-like design, and the inset patterns follow the same shape as the pierced openings and are above the pierced openings rather than below. This large structure also has overhead bracing, something never used on Michigan's concrete camelback bridges. There are a few deviations between the concrete camelback bridges that do not categorize into the above standard plans. Concrete camelback bridges were designed with either a 20 foot roadway or a 22 foot roadway. Another aspect is the floor beams for the bridges. Most of the concrete camelback bridges have floor beams that are integrated into the deck. In other words, the transverse reinforcing that is required to maker sure the girders function to support the load on the deck is embedded within the concrete of the deck itself. This is called integral floor beams. 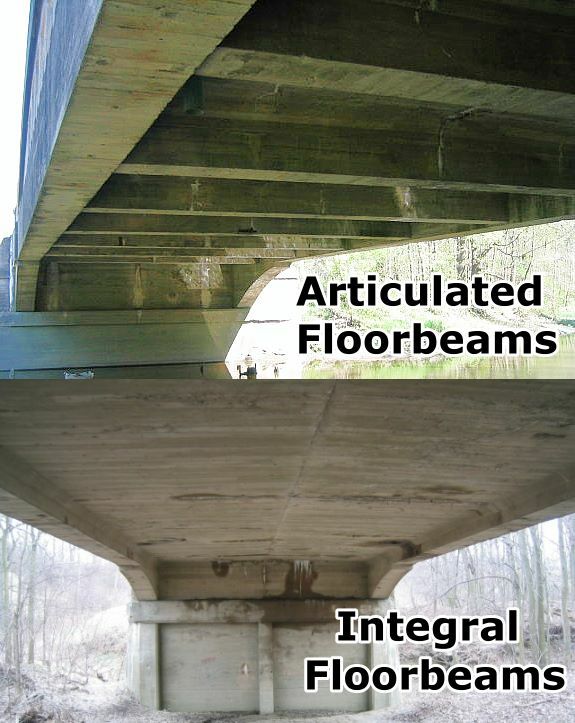 A few of the concrete camelback bridges have what are called articulated floor beams where distinctive transverse reinforced concrete beams can be seen under the concrete deck. Another detail is with the end posts of the girders. Most end with square shaped pillars with overhanging caps and with inset rectangles on the ends. The bridge plaques would be mounted on top of two of these pillars. A couple of the girders had angled platforms on top of the pillars, like a concrete podium. In this case, plaques would be mounted on these. One unusual variation appeared on a bridge near Marquette. This bridge has tall obelisk like posts on top of the end posts which appear to have originally been part of the lighting on the bridge. Most of Michigan's concrete camelback bridges seem to have been built in rural areas. A sidewalk was not part of the core standard plans for these bridges and most were built without sidewalks. A few were however. These bridges feature sidewalks that cantilever off of the outside of the girder. The railings of these bridges were a simple balustrade that was a standard used by the state highway department four a short time before switching to a fancier balustrade in 1927. These deviations show that even though the concrete camelback bridges were standard plan bridges, many design variations were still employed. The standard plan itself appears to have had some development over its relatively short period of use on Michigan roads. 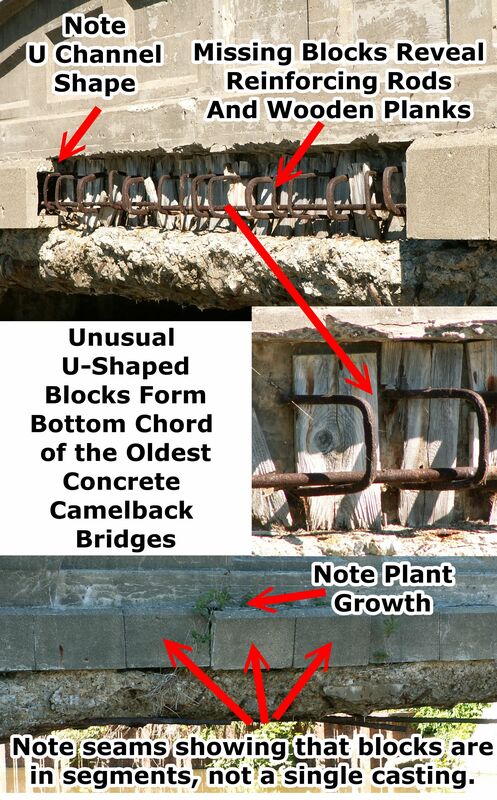 The oldest concrete camelback bridges have an unusual design for the bottom chord that uses what appears to have been pre-cast u-shaped concrete segments that were lined up alongside each other. This appears to have left a hollow space in the bottom chord. Bridges with this design show greater deterioration here, the hollow space undoubtedly being a refuge for moisture, and sometimes even plant life. This design was later dropped and the bottom chord appears to be a solid unit cast with the rest of the bridge on the majority of bridges built in the later years. Around 1926 or 1927, the Michigan State Highway Department changed the design of its standard bridge plaques from large rectangular plaques with arched title text to slightly smaller rounded rectangle plaques that did not have arched title text, but added the state seal. As such the last concrete camelback bridges that were built use the rounded rectangle plaques. 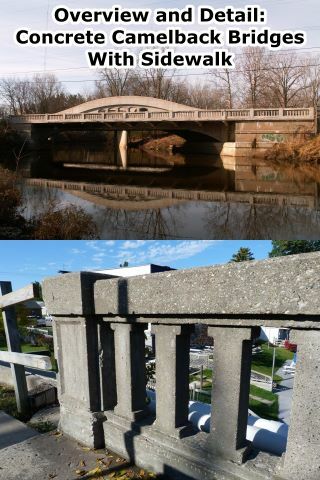 In the interest of understanding the architectural context of the concrete camelback bridges, it is worth noting a couple non-girder standard bridge designs in Michigan that borrow some of the same aesthetic qualities at some level. Michigan built small concrete t-beam and concrete slab bridges including tiny box culvert style concrete slab bridges roughly during the same time as the concrete camelback bridges. There were two standard railing designs that were of note. One looked very much like a tiny concrete camelback bridge. The appearance is similar to that of a 40 foot plan. However, the curve on the railing ends short of the end post so there is a short section of straight railing. Also, the inset rectangles with curved tops are omitted in the railing. Another railing design that was used on the smallest bridges is less similar to the concrete camelback bridges. It is more of a rounded rectangle shape and it lacks end posts. However, the rounding of the rectangles making a subtle suggestion of curve and the inset center panels that follow the shape of the outer portion of the railing speaks to a similar aesthetic thinking. Dewart apparently designed these bridges to have an extremely large safety margin. He succeeded. Most bridges of other structure types built during the 1920s that remain today have weight limits, and these weight limits may be quite low. In contrast many of these concrete camelback bridges still exist today with no posted weight limit, or an extremely high weight limit. Many of these bridges are even on routes that carry truck traffic. It is amazing how overbuilt concrete camelback bridges really were. They may be some of the structurally safest bridges ever built. Parking heavy machinery on a deck of a girder bridge that no longer has girders is about the dumbest thing you can do. Regardless, this is what the contractors who demolished the Wadhams Road Bridge in St. Clair County did successfully without incident. Not only had all but the bottom chord of the girders been demolished, even worse, the deck was not completely connected at the south end, as visible in the photo below. Despite missing the majority of its load-bearing girders, the bridge did not collapse. This suggests how strong these girder bridges really are, as well as the fact that they are apparently dummy-proof! When first built, the Lincoln Road Bridge in Gratiot County had a 220 ton test load placed on it, another demonstration of the strength of a concrete camelback bridge. See the photo below. Historically, floods were often something that destroyed bridges. Even modern bridges are sometimes destroyed in floods. However, a concrete camelback bridge in Marquette showed that a flood is no match for a concrete camelback bridge. In 2003, a nearby dam broke and sent a massive flow of fast-moving flood waters crashing right into the side of the bridge. The water, finding itself to be no match for the strength of the bridge, instead went around the bridge and eroded away the approach to the bridge. After the flood, the undamaged bridge stood with its abutments completely uncovered. The bridge's approaches were rebuilt, and the bridge continues to stand today as a testimony to the strength of the concrete camelback bridge. See the photos below. The left two photos were taken by the local media, the photo on the right was taken by HistoricBridges.org shortly after the flood. These concrete camelback bridges are so strong that they seem able to take substantial deterioration and still be structurally sound. Likely due to excessive use of corrosive winter deicing salts combined with a lack of maintenance, some of Michigan's concrete camelback bridges show extremely severe spalling and other forms of concrete deterioration. 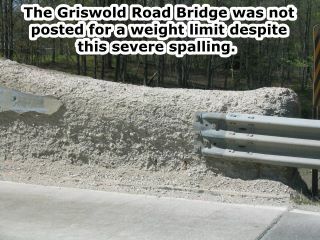 Some of these bridges remained standing in this condition with no weight limit, or with a very high weight limit. See the photo below as an example. Despite the beauty, historic significance, and durability of Michigan's Concrete Camelback Bridges, very few have been maintained or rehabilitated in a manner that would allow one to say that they were in a state of long-term historic preservation. 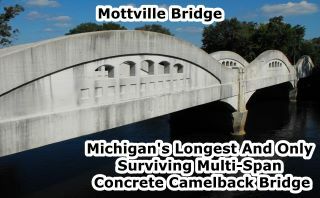 Worse, many of Michigan's surviving concrete camelback bridges have been demolished and more are slated for demolition. One of the frustrating aspects of this is that some of these bridges are far more feasible to preserve than others due to their condition or the amount of traffic they carry. Unfortunately, some of the bridges that are most feasible to preserve have been demolished, which increases the difficulty of preserving surviving concrete camelback bridges. While it would be nice to preserve all concrete camelback bridges, if all cannot be preserved, it would be preferable to select the bridges most feasible to preserve for long-term preservation. However this has not been done. Unless change comes to Michigan, future generations will be left with less than a handful of these unique bridges, since this is how few currently display a long-term preservation commitment by their owners. As of 2012, less than 40 examples appeared to remain statewide, and some of these are so deteriorated that their preservation is difficult. Moreover, those in good condition are at risk for deteriorating to a level where preservation is difficult if basic repairs and maintenance are not undertaken now. In 1995, a selected number of Michigan's concrete camelback bridges were designated in the statewide Historic Bridge Inventory as eligible for listing in the National Register of Historic Places. With many surviving examples at the time, only those concrete camelback bridges that were particularly, old, large, or otherwise stood out for some reason were designated as eligible. By 2008, Michigan's Historic Bridge Inventory was out of date since many eligible bridges had been demolished. Demolished bridges needed to be removed from the inventory, and selected bridges previously found not eligible were found eligible due to increasing age and/or rarity. The officials in charge of updating the inventory recognized the massive loss of metal truss bridges in the state and made an appropriate decision to consider all metal truss bridges eligible by default. However, these officials failed to see a similar scenario playing out with Michigan's concrete camelback bridges, and so there was no effort to reevaluate either some or all of the previously ineligible concrete camelback bridges as eligible. 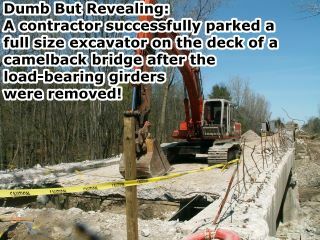 One of the problems was with the consultant that was hired to conduct the 2008 update to the Historic Bridge Inventory. 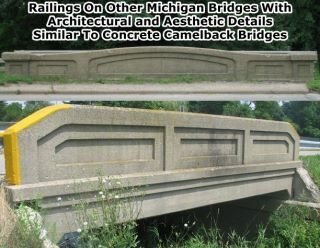 While the consultant was extremely knowledgeable and has done outstanding inventory work in other states, the consultant apparently lacked knowledge of the historical significance of concrete camelback bridges, particularly those in Michigan. The consultant's position was that concrete girder bridges were a "dead end" in bridge construction because the design did not last long and was succeeded by other bridge types, and because of this, the bridges should not be eligible for the National Register of Historic Places. Many historic bridge types ended up being dead-ends, regardless, they show the evolution of bridge engineering thinking in the United States. This should not disqualify a bridge. Further, the consultant did not appear to notice the engineering significance derived from Michigan pushing the practical limits of the concrete girder beyond the unofficial 60 foot limit found in other states. Finally, consider Criterion C under which structures can be listed in the National Register of Historic Places. Structures found eligible under Criterion C are those "that embody distinctive characteristics of a type, period, or method of construction, or that represent the work of a master, or that possess high artistic values, or that represent a significant and distinguishable entity whose components may lack individual distinction." Criterion C does not display a requirement that a structure must not be a "dead end" in the evolution of construction techniques. One of the goals of this special HistoricBridges.org narrative was to demonstrate why these findings are wrong, and why all of Michigan's surviving concrete camelback bridges should be considered eligible for the National Register of Historic Places under Criterion C. HistoricBridges.org has this position due to the significance of these bridges as described in this narrative, combined with the small number of surviving examples statewide. 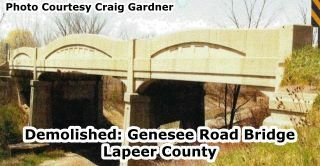 By 2012, the status of Michigan's surviving concrete camelback bridges has become dire. All but one of Michigan's multi-span concrete camelback bridges had been demolished. Some of the multi-span bridges were the most unusual and interesting examples of concrete camelback bridges, displaying spans of different size in a single bridge. These multi-span, multi-length bridges were unique structures. With no remaining bridges of this type, this is a unique part of Michigan's heritage that has been forever lost. HistoricBridges.org has photos for one bridge, the Genesee Road Bridge. In addition, the Historic American Engineering Record provides documentation for a few others: the Grand River Avenue Bridge, Mosel Avenue Bridge and the adjacent Mosel Avenue Grade Separation, and also the Michigan Avenue Bridge. The only good news is that the one surviving multi-span bridge, the Mottville Bridge, has been preserved as a pedestrian bridge next to a replacement vehicular bridge. Many of the bridges that were demolished were not deteriorated. One of the common reasons for replacing these bridges is the narrow lanes the bridge roadway provides. However, officials have repeatedly failed to give serious consideration to the concept of building a new one-way bridge next to the camelback bridge and forming a one-way couplet of bridges, which would resolve this situation. Another option is to bypass the bridge with a new bridge and leave the historic bridge standing for pedestrian use. Other states have approached the planning for preserving groups of historic bridges by developing a Historic Bridge Management Plan which outlines which bridges are best suited for different preservation solutions, and how the funding and physical work of preserving the bridges will be undertaken. Michigan could consider developing a Concrete Camelback Bridge Management Plan. Regardless of what preservation solution is appropriate for a particular bridge, change needs to happen to protect this unique and beautiful part of Michigan's transportation heritage.